What are the clinical options for strawberry legs? Solving strawberry legs: When should I see a dermatologist? Strawberry legs are extremely common, affecting millions of people every year. The term “strawberry legs” is colloquial and generally describes darkened pores or small bumps at the site of each hair follicle. Home remedies may work, but in most cases dermatologists recommend laser hair removal as the most efficient and only permanent solution. Every summer, millions of women are reluctant to expose their legs because their skin is covered with darkened pores. “Strawberry legs” refers to visible dark spots at the site of each pore or hair follicle. This condition can leave legs with a rough, uneven texture and can be quite difficult to get rid of. Like countless others, you may have tried various home remedies, lotions, and creams in an effort to rid your legs of strawberry skin. If nothing works and you’re still keeping your legs under wraps, read on. In this article we list effective treatments you can try at home, as well as the clinical options that offer the best long-term solution to these black dots. Although the visual appearance is relatively consistent, the cause of strawberry legs can vary from person to person. This issue leads to tiny raised bumps, dry skin, and rough patches. There’s no itching associated with the condition and, while it may be aesthetically unappealing, it isn’t considered a disease but rather a basic variation of normal skin. Some of us are more genetically prone to keratosis than others. The condition is also more visible on some skin types, depending on one’s natural pigmentation. Folliculitis is commonly caused by bacteria or a fungal infection and appears as a patch of raised bumps or even tiny pimples above each hair follicle. Typically, mild cases of folliculitis clear up within a matter of days. More stubborn cases may warrant a visit to the dermatologist. Folliculitis can also be the result of ingrown hairs from shaving. Individuals with a history of acne or dermatitis are more prone to the condition. In some cases, the pathogenic varieties of folliculitis can be transmitted in poorly maintained hot tubs. There are a handful of common explanations for strawberry legs, most notably open comedones and enlarged pores containing dead skin, oil, and bacteria. As you can see, the term “strawberry legs” encompasses a wide variety of conditions that all present themselves with a similar pattern of raised bumps, visible skin pores, or black spots beneath the surface layer of skin. >> If you are suffering from strawberry legs due to razor burn, you also may suffer from razor burn in the pubic area. Read about causes, treatment, and prevention for this condition. While having the symptoms listed above could mean you suffer from strawberry legs, it is always important to visit an experienced professional to rule out more serious infections. Keeping your legs clean with normal soap is important, but it may not be enough. Using soaps with salicylic acid can help remove the surface layer of dead skin cells and unclog pores. An alternative to salicylic acid soaps are ones that contain benzoyl peroxide, which both kills bacteria and exfoliates the skin. In fact, exfoliation is the simplest remedy for anyone attempting to erase their strawberry skin. Removing the surface layer of dead skin cells opens up pores and prevents the formation of keratin plugs. While there are hundreds of commercial skin care scrubs available, you may opt to use one of the following natural exfoliant preparations. Note that none of these remedies are a quick fix for strawberry legs — you’ll need to keep using them for a few weeks until you see results. Also remember to rinse with lukewarm or cool water after each application, and use a commercial moisturizer or glycerin following exfoliation. Mix two parts brown sugar and aloe vera gel with one part lemon juice. This fine sugar scrub can be worked into the skin by making small, circular motions with a gentle brush, face cloth, or loofah. Mix equal parts baking soda and buttermilk into a smooth paste. Work this paste into the skin and let it set for a few minutes. The natural cleansing action of baking soda helps to unclog pores and exfoliate the skin. Prepare a natural scrub with equal parts milk and fine grained salt, then massage your legs with the preparation. As you gently scrub your wet legs with fine salt granules, you’ll loosen dead skin and clear your pores. Improper shaving techniques or the use of old, dull razors can lead to ingrown hairs and dark spots on the legs. The simplest way to avoid skin damage from shaving is to use a sharp, clean razor and not to skimp on shaving cream by using normal bath soap instead. Soap dries the skin and doesn’t produce nearly as smooth a shave. To minimize skin damage, try moisturizing your skin with coconut oil or soaking your legs for ten minutes prior to shaving. After shaving, rinse with cold water rather than warm water. Electric epilators do a wonderful job of removing hairs from the root rather than trimming them at a surface level. The downside is that while they may do an excellent job of hair removal, they can be extremely painful to use. If you have particularly sensitive skin, consider using a skin numbing product like lidocaine prior to epilating. Another pro-tip for reducing the pain is to take a very hot shower beforehand. Hot water helps to open your pores, allowing hairs to be pulled out more easily. Although the pain may seem unbearable to some, there are many advantages to epilating over waxing or shaving. The following electric epilators are recommended by users and dermatologists alike. If you are looking for versatility, look no further. 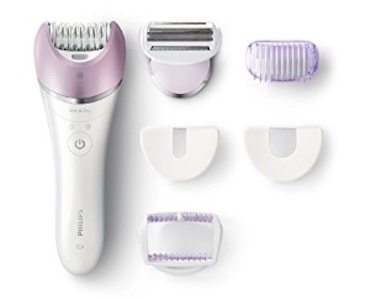 The Braun Silk-épil 9 has attachments that convert it into a facial brush, for removing pore-deep impurities, and a shaver head to trim down longer hair. Its waterproof design lets you epilate in the shower or tub, helping to reduce discomfort. To really let you epilate anywhere, the Braun Silk-épil 9 is cordless and holds a 40-minute charge. 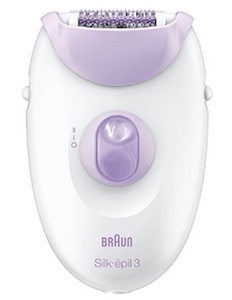 For those looking for a more focused epilating experience, Braun’s Silk-épil 3 offers a great alternative to the Silk-épil 9. 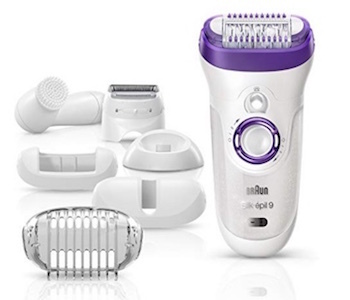 This epilator boasts a 20 tweezer system that plucks hair at its root, and its built in Smartlight helps you pick out even the smallest hairs. Although it’s neither waterproof nor cordless, the Silk-épil 3 more than makes up for its shortcomings with its affordable price. Like the Silk-épil 9, Philips’ Satinelle Advanced comes with a shaving head and is both waterproof and cordless. Its ergonomic handle design makes holding onto the epilator simple, even in the shower, and its built in light offers a clear view of those difficult to spot hairs. Instead of tweezers, the Satinelle Advanced uses textured ceramic disks to gently extract even the finest hairs. Epilady has a long history of making epilators. In fact, they introduced the world to electric epilators back in 1986. 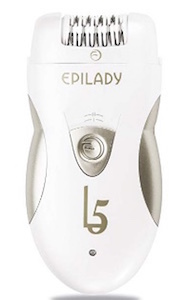 The L5 is the latest in the company’s long line of epilators that have only improved model after model. Boasting 56 tweezers and a 60-minute battery for cordless use, the L5 proves that Epilady is not dated, but a modern classic. 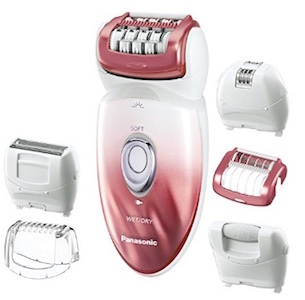 This epilator comes with several attachments to ensure that you have the right tool for the job. A small surface epilator attachment helps with precision, while the large surface attachment handles legs and arms quickly. It’s also cordless and waterproof for epilating in the bath and shower. One of the Panasonic Wet/Dry Epilator and Shaver’s best features is that its blades are easily replaceable, meaning you can use it for years to come. If home remedies fall short of providing the desired results, the first step is to consult with a dermatologist for some insight into what’s causing that spotted, rough texture. If the spotted skin is caused by bacterial or fungal folliculitis, your dermatologist may recommend a prescription solution. Prescription solutions for bacterial folliculitis include topical preparations of clindamycin, erythromycin, and other antibiotics. Prescription solutions for fungal folliculitis include topical antifungals like ciclopirox and ketoconazole. If the problem is everyday keratosis pilaris, dermatologists recommend light chemical peels and laser hair removal. Chemical peels, including salicylic acid and glycolic acid, offer the combined effect of reducing pore size, evening out skin tone, and removing the surface layer of dead skin cells. Chemical peels also improve circulation within the skin and can help prevent pores from getting clogged. Laser hair removal uses pulses of concentrated light to destroy the hair follicle beneath the surface of the skin. Laser treatment typically achieves a permanent reduction in hair growth after three to eight treatments. Note that some stubborn hair follicles may grow back and require touch-up work at a later date. There are multiple types of lasers, each with their own specific strengths, weaknesses, and uses. Your dermatologist will make a recommendation based on your specific condition and natural level of skin pigmentation. While there are several remedies for strawberry legs, their effectiveness varies depending on the underlying cause. For instance, if the cause is a stubborn bacterial or fungal infection — as is the case with folliculitis — a prescription antibacterial or antifungal may be necessary. If your condition is more than mild, or if you have already tried at-home treatments and they didn’t work for you, it may be time to schedule an appointment with your dermatologist. » Use Zwivel’s online directory to locate a board-certified dermatologist in your area and schedule an appointment today. American Academy of Dermatology. How to shave.